We can meet your flooring needs with the appropriate solution for most situations. We have a crew of full-time flooring installers, who can do any size residential or commercial job. We do very high quality work. Unfinished flooring is a 3/4” thick, tongue and groove floor. After we install the floor, we have to sand the wood, and stain, if desired, then apply 3 coats of polyurethane on the job site. Pre-finished flooring has the finish applied by the manufacturer. 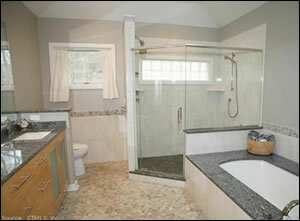 This type of flooring has become as widely available as unfinished wood flooring. These floors require less time to install because the sanding and finishing process has already happened. The floors are ready to walk on immediately following the installation and have a harder surface. Solid wood flooring is exactly what the name implies: a solid piece of wood from top to bottom. The thickness of solid wood flooring can vary, but generally ranges from ¾” to 5/16”. One of the many benefits of solid wood flooring is that it can be sanded and refinished many times. Engineered wood floors are real wood floors that are manufactured using three to nine layers of different wood veneers. The sub layers can be of the same species, or of different species. The grain of each layer runs in different directions, which makes it very stable. This means that the wood will expand and contract less than solid wood flooring during fluctuations in humidity and temperature. The top layer of engineered wood flooring consists of high-quality wood. While this type of flooring can be sanded and finished, it cannot be done as many times as solid wood flooring. 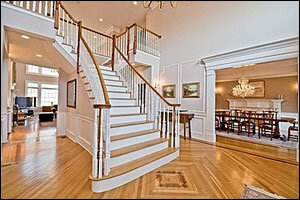 We also sand and refinish existing hardwood floors. Our workers are repeatedly praised for their neatness, hard work, and attention to detail. We are registered and insured and our work is guaranteed. Sanding and refinishing existing hardwood floors.